Whatever your storage needs, we have all the products, solutions and accessories you need to make the most out of every section of available space in your storage area. Whether it’s a warehouse racking, commercial shelving system, textile racking, or automated storage system, we are the best choice when you want a hard-working storage solution that will save you time and money. 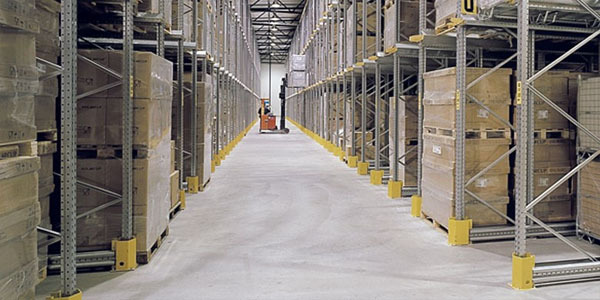 Find the perfect fit pallet racking storage solution for your requirements. 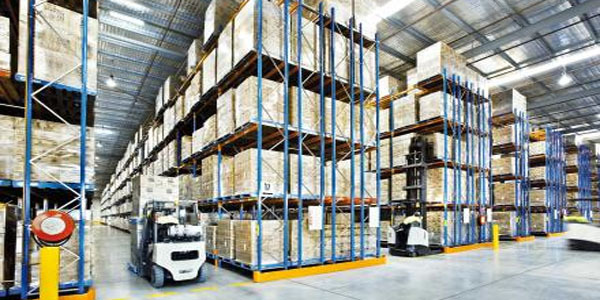 Pallet racking can be easily configured in a variety of ways based on your needs and pallet load, to ensure a functional and logical warehouse storage solution for you. 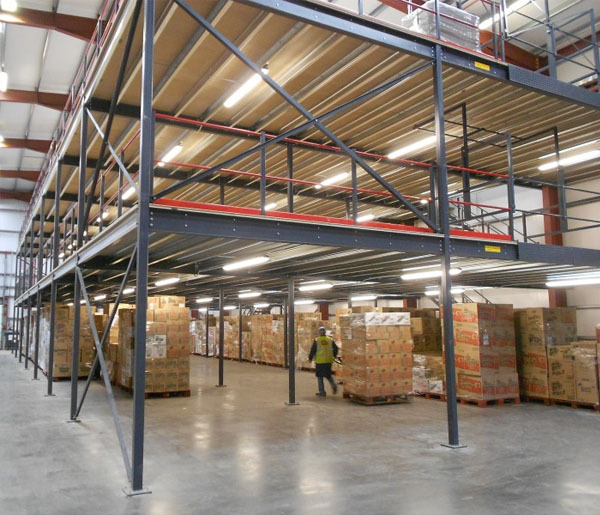 Selective pallet racking is very cost-effective, providing high capacity storage and easy access to all pallets. It is ideal for businesses that have many different products that go to a lot of different places, where orders are complex and involve a mix of different SKUs. 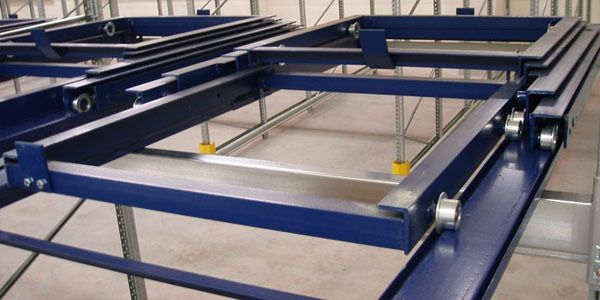 Simple to install, selective pallet racking is infinitely adjustable and easy to customise. 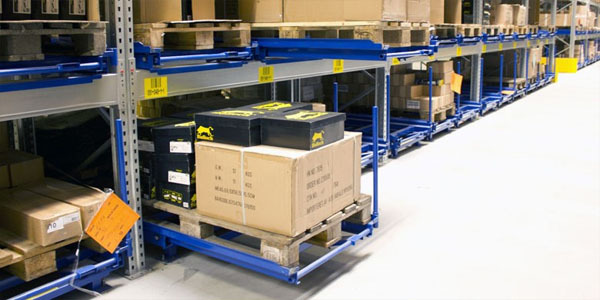 Selective pallet racking is serviced by conventional forklift trucks. Double deep racking stores products up to four pallets deep, allowing for rapid dispatch of large, single-SKU orders. Ideal for businesses which don’t have too many different products, but are distributed in high volumes where the same SKUs are stored in groups of pallets prior to dispatch. The double entry aisle allows unparalleled access via dual pantograph or sliding fork attachments. Narrow Aisle Pallet Racking is your ultimate space-saving option if your warehousing or storage floor space is limited. It gives your teams maximum storage capacity, and allows for quick order-picking and fast accessibility to every pallet. 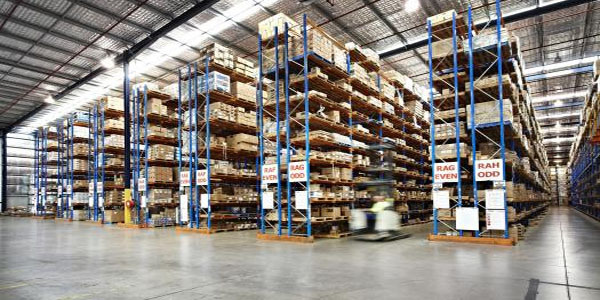 Narrow Aisle Pallet Racking combines a wealth of features to enable the best possible use of space, and fast order-picking. Compact and efficient, it's a construction set-up used in a wide variety of industries where warehousing space is limited. Varying shelving heights and depths, together with height-adjustable supporting beams assure maximum flexibility with man-down, high-lift stackers, or man-up-order-picking stackers. It's a system perfectly suited for convenient pallet storage and retrieval or for fast order-picking straight from the pallet. Handling equipment is often highly automated, and guided by wire or rail. Mobile Racking is a dynamic solution providing up to double the storage capacity in the same area, of conventional pallet racking. 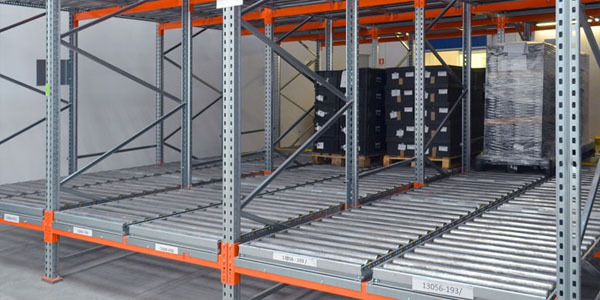 Offering technical superiority and total flexibility, Mobile Racking is suitable for every kind of stored goods, and has a wide range of accessories. 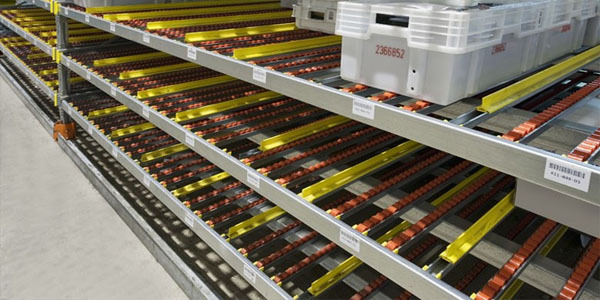 The electronically controlled Mobile Racking high-load racking system runs on in-ground rails and can carry bay loads of up to 24 tons at racking heights of up to 12 meters. While state-of-the-art sensor technology and variable control options ensure ease of operation and absolute safety. 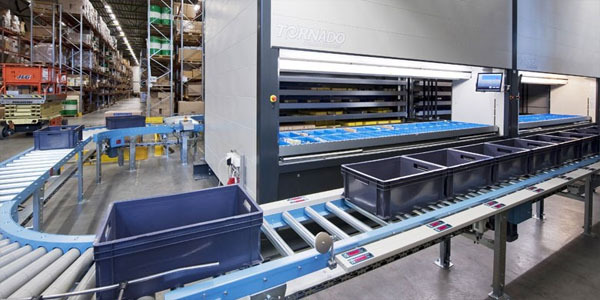 The Pallet Shuttle system is a semi-automated, high-density storage solution for the handling of goods inside channels similar to a drive-in or pallet-flow setup. 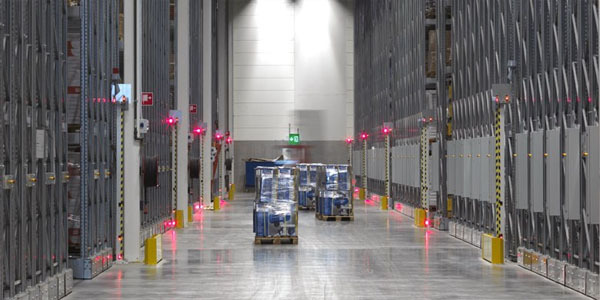 Cost-effective and time-saving, it removes the need for forklift trucks to enter the aisles. 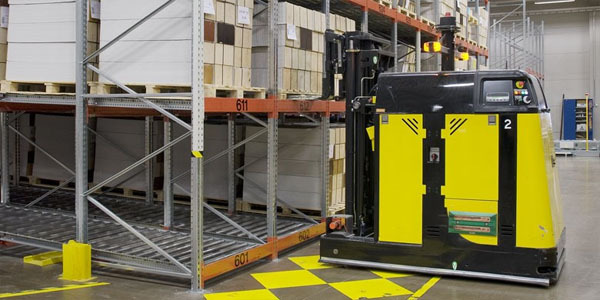 The remotely controlled Pallet Shuttle is a highly efficient alternative to live storage and drive-in racking. The Pallet Shuttle system works either as First in, First out (FIFO) or as Last in, Last out (LIFO) for situations such as cold storage, food and beverage production, and meat processing. With our Multi-tier Pallet Racking, you can create manual pick-lanes for your teams at various levels, by providing walkways built into the pallet racking structure. From a single shelving bay, to a vast installation, Our wealth of expertise and resources ensure your shelving not only meets your requirements right here, right now, but can accommodate your ongoing and changing needs in the future. 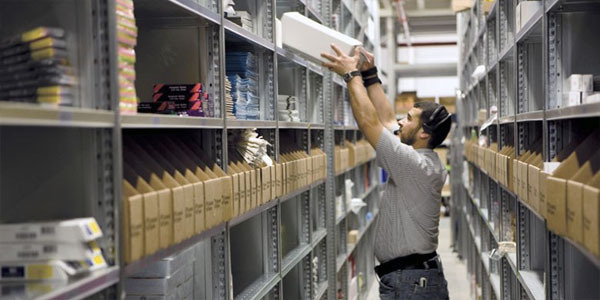 The Standard Shelving system's applications are vast. You can build it as a traditional shelving system; a high-rise installation, or a multi-tier system. Whether you're operating standalone or manually-served picking, or a large, fully-automated central store. 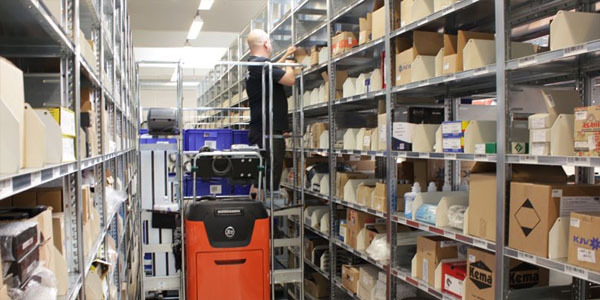 Standard Shelving is a flexible and versatile storage system for small-parts handling. Eliminating the need for cross-bracing maximises storage for its depth. While pre-galvanized steel results in a high, consistent quality, with a focus on using a minimum number of components as possible. 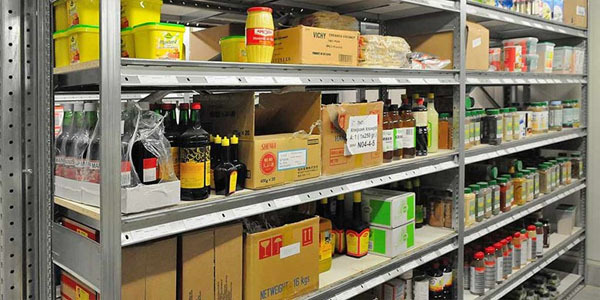 The Narrow Aisle Shelving system is well-suited for your 24hr operation. 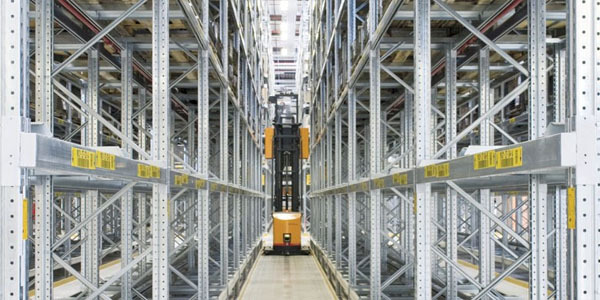 Compared to forklift handling, this is your narrow-aisle solution that works with automated cranes to optimise storage space and picking efficiency. 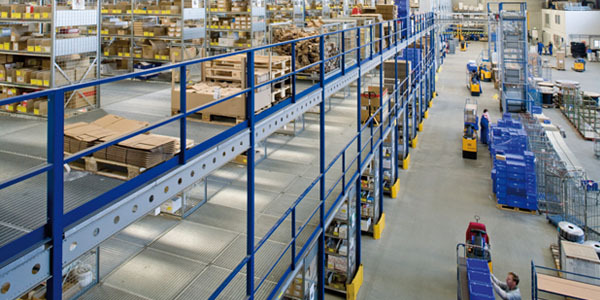 A shelving system in a narrow aisle installation demands accuracy and high stability. The Narrow Aisle Shelving System delivers on all fronts. 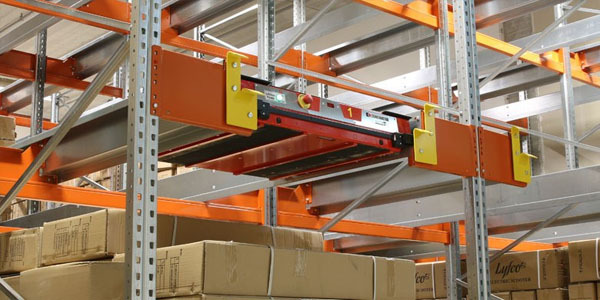 In fact, with easy access for man-up trucks, or handling by automatic cranes, a narrow aisle storage installation offers a unique optimisation of storage space. Eliminating the need for cross-bracing also maximises storage for its depth. It's a solution manufactured from pre-galvanized steel, resulting in a high, consistent quality and with a focus on using a minimum number of components as possible. The Mobile Shelving System is the ultimate in compact storage. Combined with Compactus® mobile bases, it's a mobile shelving solution ideal for small parts storage and handling. The Mobile Shelving System comes mounted on mobile units running along rails; matching the depth and width of standard Hi280 shelving sizes. As a result of only needing one aisle for access, installations in a warehouse can double the capacity of storage. 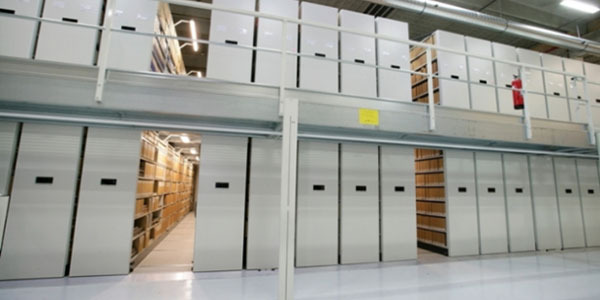 Bruynzeel’s Double Decker mobile shelving is an ideal solution to maximise your archive storage if you have a building or storage facility with high ceilings. Compactus Double Decker provides four times the capacity of ordinary static storage. It offers the ultimate space optimisation for buildings with high ceilings, and costs less than the equivalent installation of mobile shelving across two floors. A touch-sensitive electronic control panel makes operation of the system simple and user-friendly. The system’s “soft start and stop” mechanism allows the shelves to move safely and without vibration. Our sophisticated drive system moves at a constant speed regardless of load. Valuable and delicate objects remain perfectly in place. As a result, the Double Decker is proving an extremely popular choice for museum repositories, as well as for archive storage. The two levels of shelving are connected by a unique wheel console with the uprights running the full height of the system. The weight of both levels is carried solely by the mobile units on the ground floor. Top and bottom bays move together in one smooth motion along the slots in the steel grid floor. Clear sight lines between the two levels are maintained by the addition of a steel mesh mezzanine. Alternatively some customers prefer to specify wooden floor panels on the double decker mezzanine, which Bruynzeel will supply and fit on request. The system can be equipped with integrated LED lighting, and additional innovative features such as Auto Air Circulation and fire alarm integration are available. The Double Decker mobile shelving system meets PD5454 standards including BS EN15095 electrical standard, required to meet PD5454. Safety - with The Motor Current Monitoring System (MCMS) - The Motor Current Monitoring System (MCMS) ensures safety for users of Double Decker mobile shelving. MCMS detects any increase in power usage caused by the motor driving against an obstruction, which will automatically cut the motor. Additional safety systems can be added to this system, such as photo cells and motion sensors. Using these features will ensure the units stop immediately in the event of a person being detected in an open aisle. Automatic Aisle Lighting - Our Double Decker mobile shelving is fitted with aisle lights. When an aisle opens, the lights come on automatically, and are switched off again when the aisle closes. Medium Span shelving or 'Longspan shelving' is perfect if you're storing larger or heavier products across multiple pick-locations. The Medium Span Shelving is assembled in the same way as the Standard Shelving and suitable for both static and mobile requirements. It's particularly well-suited for the storage of automotive components. Standard Shelving is compatible with the Medium Span. The two shelving systems can be easily combined and configured. Eliminating the need for cross-bracing maximises storage for its depth. It's a solution manufactured from pre-galvanized steel, resulting in a high, consistent quality and with a focus on using a minimum number of components as possible. The Longspan Shelving system allows for the easy adjustment of storage heights and configurations as your requirements change; providing a system that moves and changes with you. Longspan is equally suited for warehouse and office environments; easily configurable for a number of different applications. From low level hand-loaded shelving, to high-rise systems. Textile Carousel is an automated vertical carousel that stores and retrieves rolled goods efficiently and ergonomically. 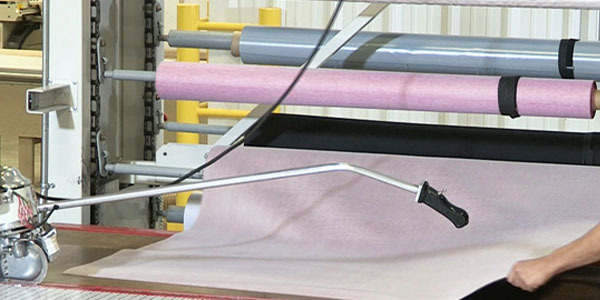 The motorized textile carousel is designed to effectively accommodate a wide variety of fabric rolls including woven, non-woven, knitted, synthetic, netting, and technical fabrics in a broad range of widths, diameters, and sizes. 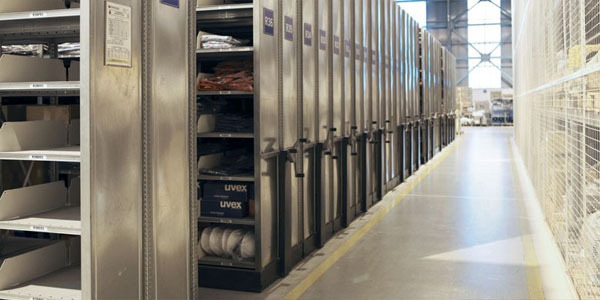 This automated storage system utilizes the vertical space in retail stores, manufacturing operations, or warehouses and brings the desired roll to the operators level, eliminating the need to manually handle textile rolls. Increases Available Storage - The motorized textile carousel increases useable storage capacity by applying the product to operator principle in underutilized overhead space. Featuring built to specification flexibility, our rolled goods carousels provides superior fit and space utilization. Increase Health and Safety - Mechanical storage eliminates wasteful and potentially harmful steps for stocking and retrieving rolled materials. The Textile Carousel accomplishes this by automating retrieval and presenting rolls at an ergonomically optimum height which reduces unnecessary bending, walking, lifting, and pushing which will reduce work related injuries. 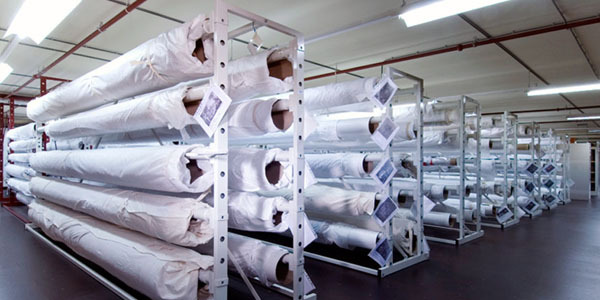 Increase Efficiency - Textile Carousel may be commonly used as either a storage unit or integrated into production lines. Either application benefits from the increased efficiencies that a vertical carousel provides, whether the result is increased output from almost negligible roll changeovers or the potential realized by automating storage and real time inventory tracking. 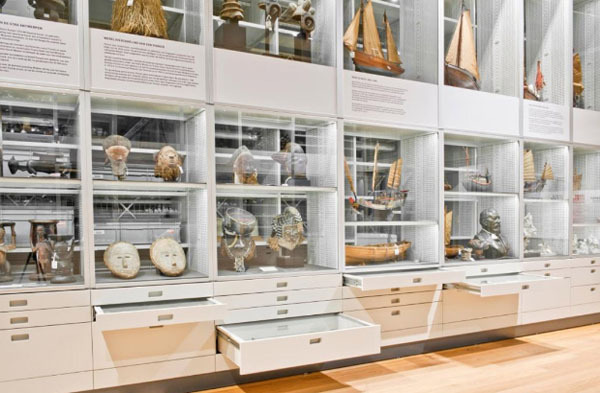 Bruynzeel Storage Systems offers a complete service for museum storage, from planning through to installation and maintenance. Our museum specialists are on hand to help you plan your ideal museum storage facility. Total Solution - Bruynzeel offers a wide product range that is perfect for museum storage, with a tailored solution for every type of object. 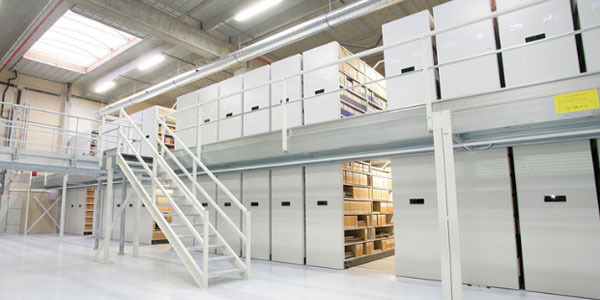 Worldwide - Bruynzeel storage solutions are used in museum warehouses around the world. Using our extensive knowledge base and years of experience, we will create a storage system that is right for you. 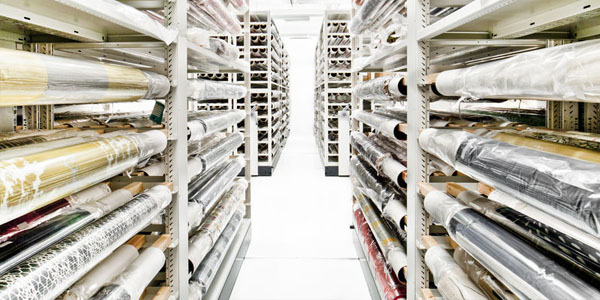 Optimal Conservation - Our museum storage can provide protection from light, dust, dirt, vibration and emissions. 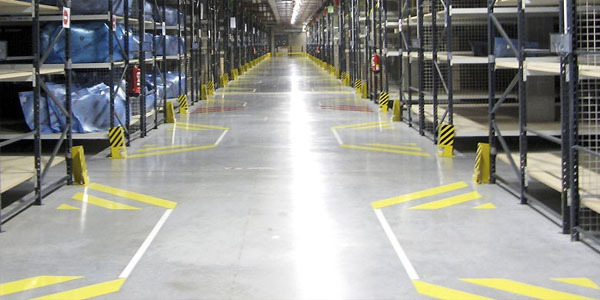 If you're a warehouse or storage operative, you'll know the importance of making every square meter count. 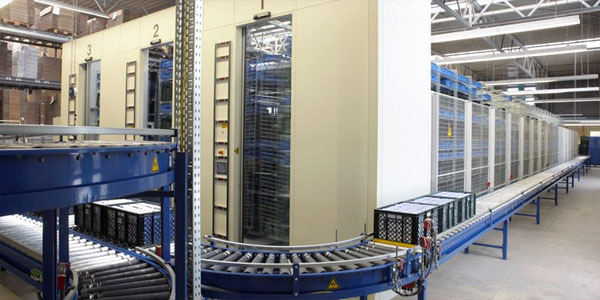 Our automatic storage systems can save you up to 70% on existing floor space, reduce picking errors by up to 70% and decrease picking time by more than 60%. 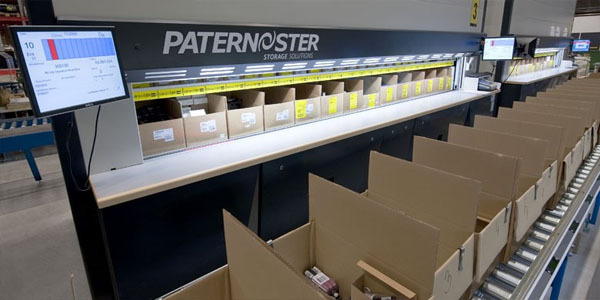 Computer-controlled, the vertical or horizontal storage machines easily integrate with your existing warehouse management system, but also operate effectively as a standalone solution. Can you afford not to improve the efficiency of your storage and picking process with an automated solution built around you? The HOCA makes optimal use of existing room length when overhead space is limited or unavailable. The HOCA is designed to keeps things moving; multiple HOCA systems working to one picking station ensures permanent access to stored goods. While the operator picks from one carousel, the other machines bring the next requested order to the access point with pinpoint accuracy. The IPN uses vertical rotation to transport goods to the operator by the shortest possible route, making it ideal for simple manual operation, host-controlled order picking or highly efficient batch-picking. It is particularly suited for fast order picking of small parts and can be easily customised, with its shelving, intermediate shelving and partitioning equipment adaptable to various height requirements.